You are here: Home / Business / Does My Business REALLY Need a Website? How is your business being found? Do you know how potential clients and customers are finding your business? (Hint, it’s not by thumbing through the “Yellow Pages”). 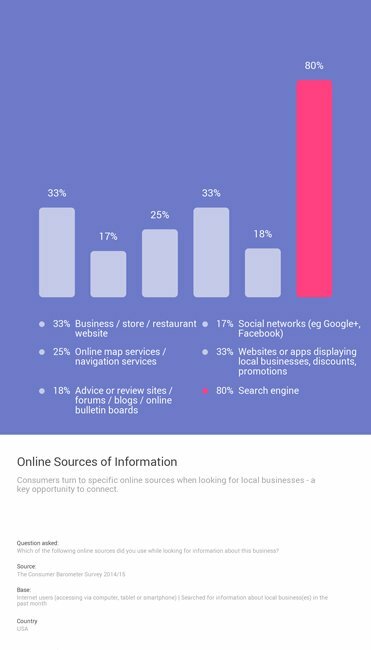 According to Consumer Barometer with Google¹, 80% of consumers use a search engine to find local businesses. If your business shows up in search, (never forget the importance of on and off site SEO as well as listing your business on “Google My Business”), the link most likely to be clicked on will be your business website. Can’t I just use my Facebook, Instagram, (fill-in-the-blank social media) or my free agency/group page? Yes, you can if you’re okay with the downsides involved. Let’s talk about some of the negative factors when you don’t actually own or control your own web presence. 1) You don’t own it. Yes, you read that correctly. You don’t own any of your social media pages. You are a “digital sharecropper”. The definition of “digital sharecropper” literally means you’re building your business on someone else’s land; online. You do the hard work planting seeds for your business and Facebook or Instagram or Google ultimately reaps the largest crop, (i.e. benefits). If Facebook or Google decides to shut down or suspend your account, you’ve lost your online web presence in mere seconds and any profits that went with it. Alternately, should Facebook or Google decide one day that they would like to charge you $__ for the “privilege of your social media account”, you’re at their mercy if you want to continue to sharecrop. (Remember Tumbtack? It used to be a free platform, but now charges business owner’s for a chance to bid on local projects/services). 2) You’re a professional in a “group” such as a realtor or doctor. If your online web presence and identity is tied to a specific company or clinic, it makes it very difficult for future clients and patients to find you if you should leave aforesaid group/company. Example: Most realtors have a web page automatically created for them by the real estate agency they’re working for. However, should that realtor decide to open their own agency or switch agencies, they will lose their “auto-generated” on-line web presence. Additionally, while aforesaid realtor might enjoy search benefits associated with a particular company,–make no mistake, ultimately all search rankings benefit the parent company; not the individual. If you have your own website, you can update your information and you still own and keep your web presence and search ranking. 3) Loss of clients who don’t trust a particular social media platform such as Facebook. The #DeleteFacebook movement is gaining momentum with each “oops, your personal information was leaked, (or sold)” incident. Did you know that Facebook has asked major banks for your banking information? (You can help make a difference by protecting your privacy here: https://action.consumerreports.org/20181116privacyfb). Tech entrepreneur Steve Wozniak says he’s quitting Facebook. Wozniak, who co-founded Apple with Steve Jobs, told USA Today that he is abandoning the social media giant, joining the #DeleteFacebook movement in which Facebook users are shutting down their accounts over concerns about the use of their personal information. “Users provide every detail of their life to Facebook,” Wozniak told the newspaper in an interview published Sunday. Sound familiar? While this is a topic we’ve written about before, by now you should have some idea as to why you want to be a landlord instead of a digital renter or sharecropper. So, what about social media? Social media certainly has a place in any well-designed marketing plan. However, it should enhance, not replace, your own business or personal website. ¹ “Consumer Barometer from Google.” www.consumerbarometer.com/en/insights/?countryCode=US&insight=INS-US-CAT-3-CHART-2. ² Simone, Sonia. “Digital Sharecropping: The Most Dangerous Threat to Your Content Marketing Strategy.” Copyblogger, 28 July 2015, www.copyblogger.com/digital-sharecropping/. ³ Bever, Lindsey. “Why Apple co-founder Steve Wozniak is joining the #DeleteFacebook movement.” The Washington Post, The Switch, 9 Apr. 2018, www.washingtonpost.com/news/the-switch/wp/2018/04/09/why-apple-co-founder-steve-wozniak-is-joining-the-deletefacebook-movement.